I get lots of questions about how our Crate & Barrel Lounge Sofa is holding up, how we keep it clean, and how it handles all of the pet and kid chaos. Today I’m sharing all of the details on how to clean this couch, and how ours is holding up after living with it for 9 months. This post is sponsored by Mohawk Consumer Products and contains affiliate links. Click here to read my full disclosure policy. Back in December, Corey and I splurged on the nicest (and most expensive) piece of furniture we’ve ever bought – the Crate & Barrel Lounge II Petite sofa. I did a quick review of it right after we purchased it, and ever since then our sofa has been one of the most highly talked about items we own – I get more comments and questions about it than almost anything else and they all have the same theme: how is it holding up, and how hard is it to keep clean with the dogs? Well, I’m here to definitively answer your questions once and for all in this post. 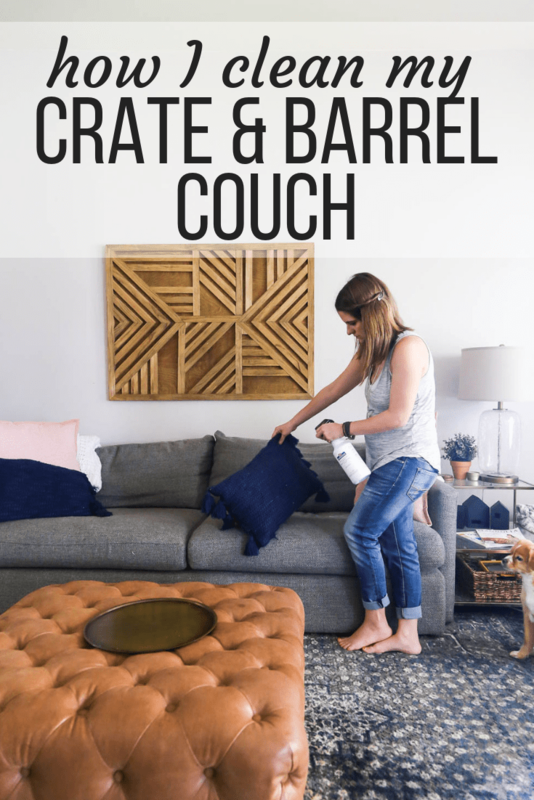 And, even if you aren’t looking into getting a Crate & Barrel sofa for your home, the tips in this post on how to clean a couch are applicable to just about any sofa and I promise you’ll want to know this quick trick to make your life way simpler! How is your Crate & Barrel Lounge Sofa holding up? Great! We’ve had the sofa for about 9 months now and it’s seen a lot of use. Our Doberman sleeps on it all night long every single night, and during the day there’s pretty much always a dog or two on it (along with a few humans on occasion). In fact, as I write this post I’m sitting on the couch with the baby on my chest and both dogs laying next to me. Basically, what I’m saying is, we haven’t exactly been gentle on this thing so far. Our sofa still looks more or less brand new. There aren’t any stains or snags on the fabric (we have the Taft fabric in Steel), and with a quick fluff, the back cushions hold their shape beautifully. We haven’t noticed any fading anywhere and really, as a whole, have absolutely no complaints about how the sofa is holding up so far. Of course, we haven’t maintained the sofa without any effort. Here’s a quick rundown of what I do to keep it looking (and, ahem, smelling) great all the time. Before I dive in, I made a quick video for those of you who like to see things in action! As a bonus, you’ll get a little peek at the baby – so you probably are gonna want to watch it. For those of you who don’t like babies (or can’t watch the video for some other reason), here’s a more detailed rundown of my process. AS NEEDED: The first thing I do to keep things looking good is that I take care of any spills or messes the moment they happen. With a four-year-old who loves to have a snack while watching a movie, there are inevitably spills and messes that happen. I take care of any spills as soon as I possibly can with just a plain old dish towel and some water. The fabric is pretty stain resistant to begin with, so as long as I catch it right away, small messes tend to come right up. WEEKLY: Once a week or so, I go over the entire sofa with our handheld vacuum (we have – and love – this one). This gets up the pet hair, crumbs, dirt, and general day-to-day life mess – and I’ve found that keeping dog hair off the couch is one of the keys to keeping it smelling great. Because, let’s be real, if I let my Doberman sleep on this thing every night without any sort of upkeep, it would quickly reek of dog. SEASONALLY: Here’s where the meat of the effort comes in – the most important part! Every three months or so, I do a more thorough deep cleaning of our sofa, and really, this is the key to keeping things looking (and smelling) great. The first thing I do seasonally is wash the cushion covers. I can’t officially recommend that you wash your Crate & Barrel couch cushions because technically I believe they’re dry clean only. But what I can tell you is that I’ve washed ours twice in the 9 months that we’ve owned this couch and they still look brand new! I decided to try it one day when I was nesting and desperate for a super clean sofa, and I’ve never looked back. I only wash the covers on the delicate cycle on my washing machine, and I never put them in the dryer – I let them air dry for a few hours before putting them back on the sofa. Then, when everything is dry and put back together, I add some protection. ** Please note: Always test washing your cushions on one of the throw pillows before you throw it all in the washer. I’ve washed mine multiple times without issue, but have heard from a reader who had problems when testing hers. My secret to protecting our sofa from the chaos, messes, and spills of everyday life is that I use Mohawk Consumer Product’s Fabric Guard. 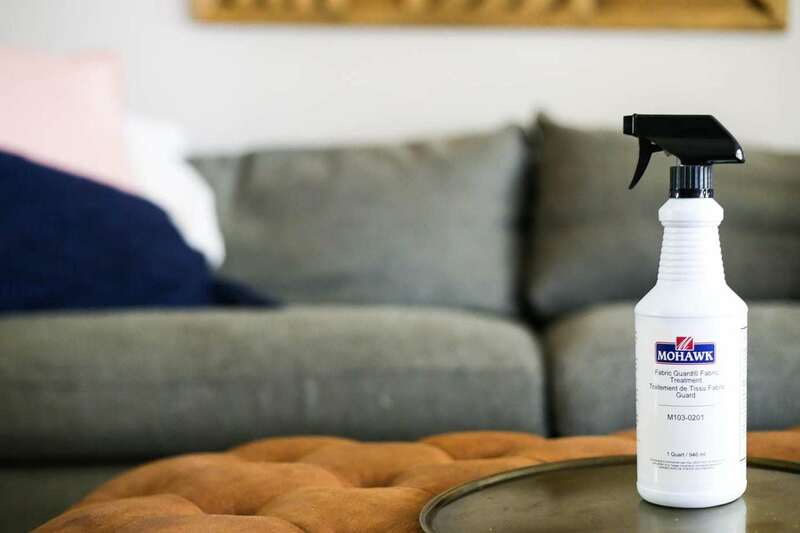 It’s a super simple to use fabric protection spray that helps repel stains and keep all of the fabric in your home looking fresh and clean all the time. This stuff is the real deal, y’all. If you’ve ever tried other fabric protecting sprays, you may have noticed that they take forever to dry or are super stinky (and then, they don’t really work all that well). Not so with this stuff – it dries in a mere 10 minutes and is completely (yes, completely) odorless! 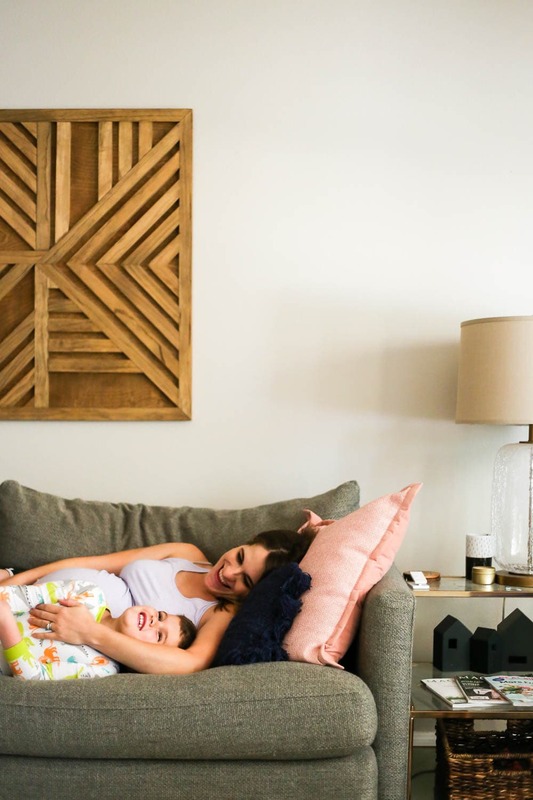 It doesn’t have any harsh chemicals (which I’m a fan of with a brand new baby) and is great at repelling water, oil, and other types of stains – and it resists soil really well too! All I do to protect our sofa from stains is spray the entire couch (and all of the throw pillows, etc.) down with the Fabric Guard, then allow it to dry for 10 minutes. That’s it. Then, I rest easy knowing that my couch is protected from stains and I can spend my time worrying about other things (like how to keep my floors clean). The bottle is huge, so even though it isn’t the cheapest fabric protector out there, I know that a bottle will last me a year or more – and it’s totally worth the added expense to be sure my (super pricey) couch stays nice and clean! 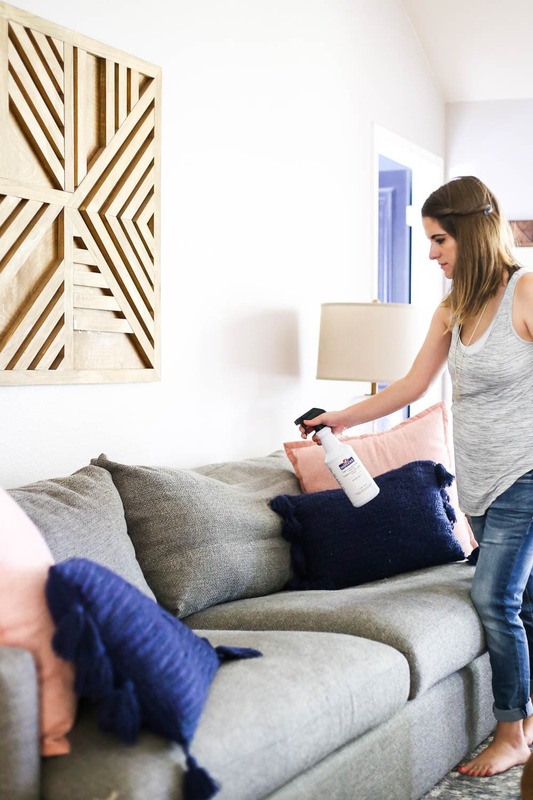 A quick note – you always want to test out any spray like this on an inconspicuous area of the sofa (or whatever you’re protecting) before applying it all over! Since this stuff is water-based it should do perfectly fine with any fabric that can be cleaned with water, but when you’re cleaning big, expensive furniture it never hurts to be extra careful. If you know me, you’ll know that I’m just a little bit obsessed with any cleaning solution that helps me keep my home looking great with less effort on my part, and this stuff is no exception. 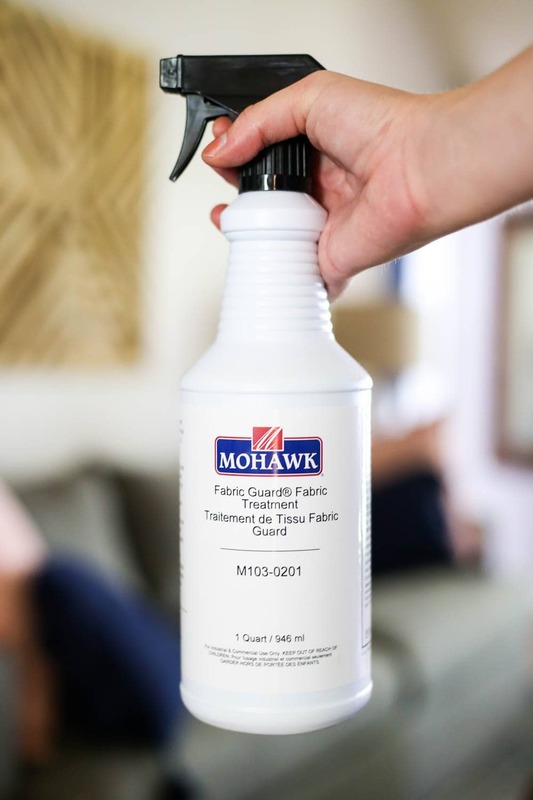 If you own a couch, an upholstered chair, or even just some throw pillows, you’re going to want to check out Mohawk’s Fabric Guard to help you keep things cleaner. Who wouldn’t want a super clean sofa all the time with just a few minutes of effort?! Looking for more quick cleaning tricks? We’re looking at this exact sofa for our new home with an almost two year old, and I’m wondering if you’ve experienced any pilling with the Taft fabric? Not pulling or snags, but fiber flyaways? The sample we received seems to hold up to stains pretty well, but my biggest concern is having a beautiful couch that looks as though it needs a shave. Hi Laura – We’ve had it for a little over a year now, and yes, there is some pilling. I think if you just have kids that it likely wouldn’t be an issue. However, our doberman sleeps on the couch every night and I’m positive that’s what has caused the pilling. It’s not terrible, but it does annoy me a bit! Great idea to clean a sofa. thank you for your information. Following your advice, I tested washing just the pillow cover for my lounge 2 c&b sofa. Delicate cycle, special detergent just for delicate fabrics, cold water. It came out ruined, with the appearance of bubbles on the fabric where the fabric has separated from the backing. Oh no! I’m so sorry to hear that. 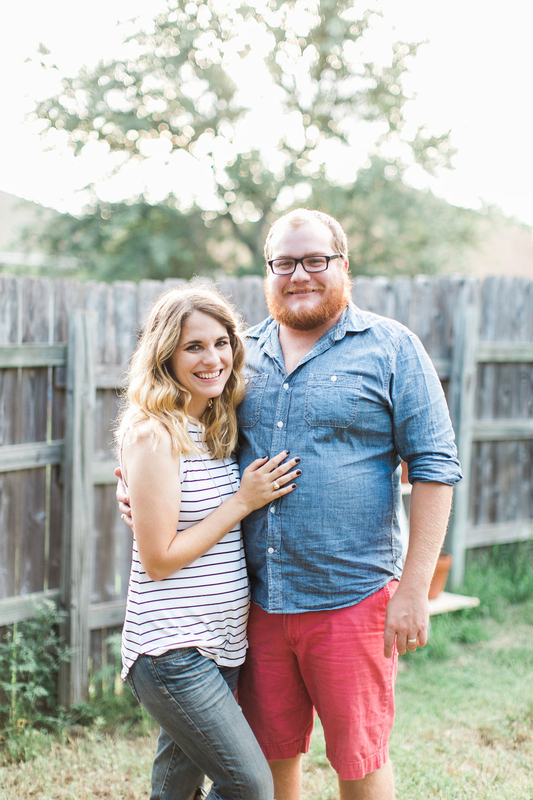 Do you have the Taft fabric? I’ve washed ours on the delicate cycle in my washer about 4-5 times now with no problems, but I’ll add a note to this post about this issue.